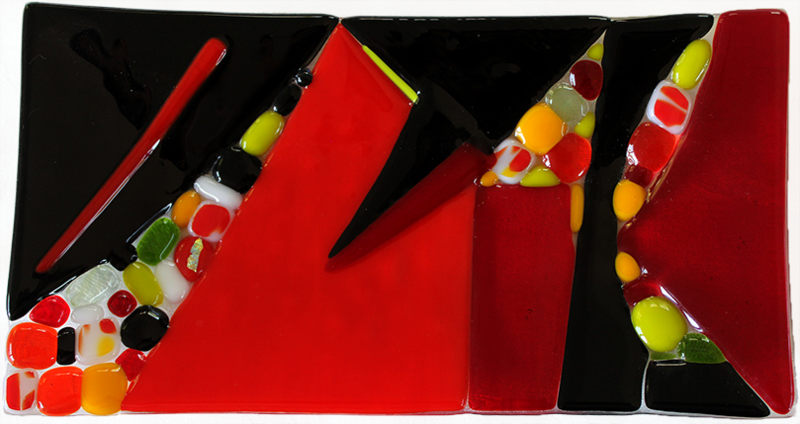 Fused glass is the result of firing layers of glass in a kiln until they coalesce. This method has been around for centuries. These techniques are generally used to create art glass, glass tiles and jewelry. Pieces of glass can be fused if they have the same co-efficient of expansion (COE)—that is, the rate they expand when headed and contract when cooled. Pieces with different COEs will shatter as they cool, since they contract at different rates. A plate of many glass elements fused together. The fusing process involves laying pieces of glass, often of different colors and shapes, on a solid glass sheet to create patterns or simple images. The glass is heated inside the kiln until the pieces bond together. When the glass is fused, the kiln temperature is reduced quickly in order to avoid devitrification (crystallization). Then it is cooled to room temperature slowly to prevent breakage. Fused glass artists use slumping techniques to create larger, functional pieces like dishes and bowls. The fused glass piece is put on the top of a mold; when the kiln heats up, it "slumps" into the mold and assumes its shape. Functional pieces generally require at least two separate firings, one to fuse the glass and the second to shape it. After this glass was fused, it was fired again on a mold, where it slumped into the shape of a bowl. Dichroic glass is fairly new: it was developed in the 90s for satellite mirrors, but has become very popular among glass artists. It consists of stacked layers of glass and micro layers of metals or oxides that reflect and refract light. The colors shift when you see it from different angles, giving the glass a marvelous shimmering quality. Many of the pieces in this website include dichroic glass. 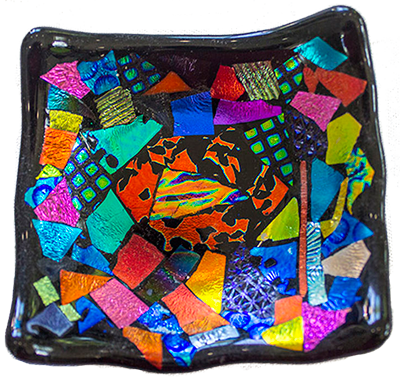 The example below is full of dichroic glass pieces.